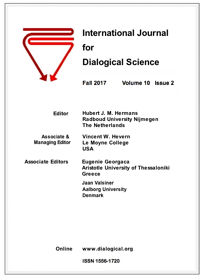 The International Journal for Dialogical Science (IJDS) is a peer-reviewed scholarly publication sponsored by the International Society for Dialogical Science (ISDS) and distributed digitally at this Web site. General Editor, Hubert J. M. Hermans, has published an article and editorial looking at the status of research on Dialogical Self Theory, the achievements of the IJDS, and a new publishing opportunity with the Journal of Constructivist Psychology (JCP). After a decade of online publication across ten volumes, the IJDS is merging with the JCP in 2018 and future submissions should be directed to the JCP. Hermans' article-editorial with this announcement can be found at this link. As Hermans notes in his article, "For the foreseeable future, an archive of the complete IJDS will continue to be available online at the current website: <http://ijds.lemoyne.edu/index.html>. We are committed to arranging for a permanent archive for the journal to ensure its availability for future scholars and are actively exploring options to achieve that aim." Edited by Dany Boulanger and Jaan Valsiner, the new special issue of IJDS comprises a collection of 14 papers examining the topic: The Self and Society in Dialogue--Linking Two Theories. The issue can be found at this link. Two new articles comprise the Summer 2017 issue of the IJDS. They can be found at this link. A new (belated) issue of the IJDS has been published at this link. It includes both a special issue section of five papers on "Eastern Perspectives on the Dialogical Self" (guest edited by Shaima Ahammed & Isaac Cherian) as well as two regular articles: Jan Grimell (Vrije University, Amsterdam, The Netherlands) describes "A Traditional Narrative of Military Identity: Eric's Story) while Ingvild Folkvord (Norwegian University of Science and Technology) and Marion Lauscke (Humboldt University Berlin) analyze "The Materiality of the Body Speaking Its Mother Tongue: About Dialogues and Phenomena of Resonance." The newest issue of the IJDS (Vol. 8. No. 1, Spring, 2014) contains two articles and one book review. Norbert Wiley (University of Illinois-Urbana) examines "Chomsky's Anomaly: Inner Speech" while Jacok K. Farnsworth (University of North Texas) provides a broad analysis of "Dialogical Tensions in Heroic Masculinity and Military-related Moral Injury." Marius Wolonciej (John Paul II Catholic University of Lublin, Poland) reviews Hermans & Gieser's (2012) Handbook of Dialogical Self Theory. A new Associate Editor of the IJDS has been appointed. She is Prof. Eugenie Georgaca who serves as a Senior Lecturer in the Psychology Department at the Aristotle University of Thessaloniki. A clinical psychologist, Dr. Georgaca has a broad set of interests in the field of mental health with a focus upon serious mental disorders, the role of social and cultural factors in their development and treatment, and the use of dialogical approaches in psychotherapy. She is replacing Dr. Giancarlo Dimaggio who has ably served the journal from its foundation and contributed so effectively to advancing our understanding of psychotherapeutic processes from the vantage of dialogical self theory. Acceptance and publication of a paper or commentary in the journal automatically leads to membership of the ISDS. This policy has the advantage that membership is directly dependent on the scientific and professional interest and qualities of the person who submits a manuscript. Another advantage is that there is no obligation to pay any dues. In this way the journal maintains an open character with a simultaneous guarantee of the quality of the papers by peer-reviewed procedures.